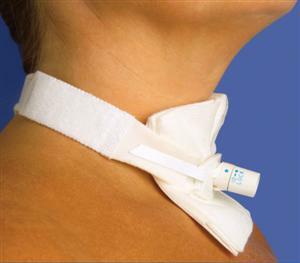 Tracheostomy Tube Holder: Keeps tracheostomy tube securely in place. Soft strap features an adjustable Velcro closure. One size fits all. Soft compliant foam laminate with elastic adjustment increases patient comfort and accommodates coughing and edema while still providing a snug fit. Soft twill ribbon between collar and tube helps prevent sliding and patient irritation, and also helps prevent neckband from becoming soiled. Tracheostomy Tube Holder, Universal Size, 2 piece.